In stock -This product will ship today if ordered within the next 1 hours and 46 minutes. The Calm & Clear Mist cleanses, rehydrates, tones and nurtures your skin with balancing flower essences and botanicals. Its exotic oils and essences will soothe your skin and uplift your emotions. Australian Bush Flowers (ABF) meet the great need for remedies that help people address the health and beauty issues that can sometimes arise in the 21st century. Australian Bush Flowers were created as a means of healing and promoting health benefits that anyone can use or provide to others without the need for a prescription. Flower essences have been used for thousands of years, but Australian Bush Flowers have been able to utilise the power of flower essences and convert them into remedies for the modern era. Organic Aloe barbadensis leaf juice, Organic alcohol, Organic glycerin, Aqua, Polyglyceryl-10 Laurate*, Glycerin*, Lavandula angustifolia (Lavender) oil, Citrus aurantium (Neroli) flower oil, Pogostemon cablin (Patchouli) oil, Citrus aurantium dulcis (Orange) oil, Tetratheca ericifolia essence, Boronia ledifolia essence, Callistemon linearis essence, Epacris longiflora essence, Crowea saligna essence, Jacaranda mimosaefolia essence, Actinotus minor essence, Carica papaya essence, Chamomilla recutita (Matricaria) flower extract, Calendula officinalis flower extract, Organic Arnica montana flower extract, Echinacea purpurea root extract, sodium anisate*, sodium levulinate*, potassium sorbate, citric acid*, farsenol^, geraniol^, limonene^, linalool^. Gently mist or spray into the air as required. Safe for use on skin. 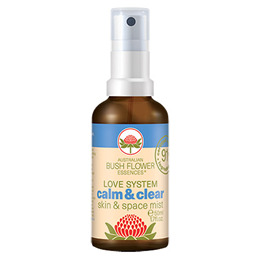 Below are reviews of Australian Bush Flowers - Calm & Clear Mist - 50ml by bodykind customers. If you have tried this product we'd love to hear what you think so please leave a review.